Below is a comment I submitted to the L.A. Times in response to their article on this new type of merit pay (read it here). This week we lost two of our teachers new to LAAMS who were rehired at their former schools or picked up a position in another capacity. Combined with the lateness with which many current positions were filled this school year (some 6 weeks into the school year), we have had/will have several classes taught by long-term subs at LAAMS this year. This is not good. 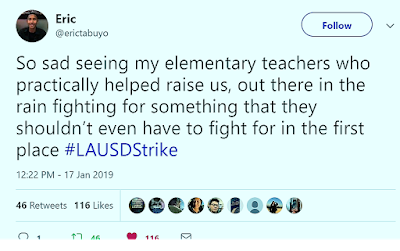 So let's get this straight: LAUSD fires thousands of teachers, South Central is hit disproportionately with 40% of these, LAUSD sends us permanent teachers in an untimely manner, then takes them back without regard to the children in the classrooms? Truly, if South Central isn't bearing the brunt of these cuts, who is? How many more new staff will be pulled back to their former positions, causing disruption to all involved?